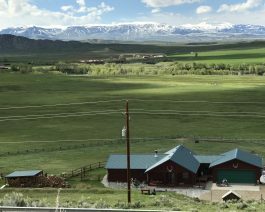 4 Bears B&B is located in a ranch setting with some of the best views in Wyoming. The view alone is worth staying here! It is only a 5 minute walk from Lower Sun Shine Lake, ½ mile from the Greybull River and 1 ½ miles from the Wood River, so it is perfectly located for those who like to fish, hike or bike. Deer and antelope are right next to the property and if you take a wildlife tour you will probably see more wildlife than you will see in the park. The property has three rooms and of course serves breakfast every morning. The beds are top of the line Temperupedic and Post-ur Pedic mattresses along with MY Pillows to assure a good night sleep. This very quiet location offers amazing star gazing and is the perfect place to enjoy your relaxing vacation.